Trey Ratcliff is probably the most famous photographer online. He is most well known for his HDR and travel photography. But he is also a great author, teacher and entrepreneur who offers books, video courses, workshops, apps and online services for photographers. Miss Aniela is a successful fine-art and commercial photographer. The self-taught and self-made artist came to fame with self-portrait composits some seven years ago. Since then, she has developed into an internationally acclaimed photographer with exhibitions and sponsors all over the world. Miss Aniela takes you through differet sets and shooting situations giving you tips on the setup and the lighting for location portraits. And she shows you how to post-process this type of image. You will also learn the thought process and ratio behind the photos and the post-processing that goes into creating the final images. The setting of this video tutorial is a workshop that took place in the French country side inside and around the Château de Champlâtreux. In the first part, Trey Ratcliff leads you (and his workshop students at the location) through the Château and shows you how to capture different HDR scenes. He describes his intentions, his choice of subjects and his camera settings for every scene. You will get a good overview over HDR photography, how to set up your camera, how to compose a shot, and how to get a certain look. The different sections of the video cover interior shoots, outdoor shoots (also shooting into the sun) and low-light shoots inside the Château and the dungeons beneath it. So you will learn how to deal with each of these vastly different shooting situations. Then, Trey moves on to post-process the different photos with Photomatix, Lightroom and Photoshop. You will pick up a lot of his techniques, and you will learn about his workflow and how he uses the different tools to create his characteristic look. 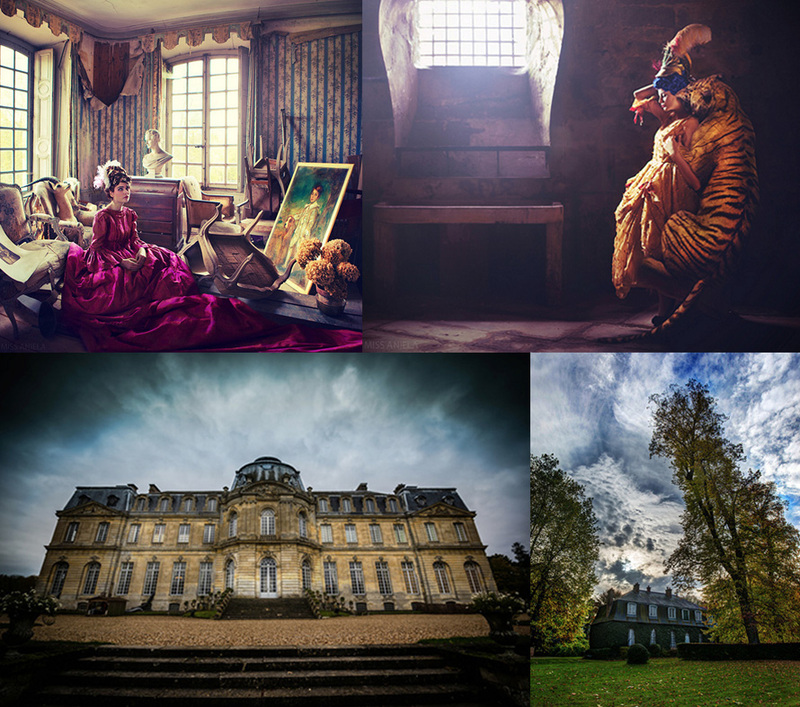 In the second part, Miss Aniela leads you through a renaissance-themed series of location portrait shoots with the beautiful interior of the Château as the setting and mainly with natural light. You will learn how to set up such a scene and what to look for in your composition. In her post-processing, she shows you how to bring those images to life in Photoshop. She also shows how to create composits with elements that have actually never been at the set. Mastering these skills will enable you to create virtually any image – even impossible ones – from a set of source images that you combine. As a bonus, Trey and Miss Aniela have added some post-processing sessions beyond those shown to the physical workshop participants. The video workshop also comes with over 50 of the original Raw files created during the live workshop, including Trey’s HDR exposure series. So you can follow the steps that Trey takes to post-process them. If you have never been a participant at a photography workshop, you will pick up some of the atmosphere, and you will see how these events are run. That may be helpful when you decide which workshops too book in the future. Trey’s style is casual and relaxed as always. Throughout the videos, you always have the impression that you are on a photography tour with a good friend rather than on a teaching event. This is one of Trey’s big strengths: He makes it look so easy and simple, and he creates a friendly atmosphere for his students (the ones in front of the monitor as well). Nothing feels like it’s set up or prepared, and that’s because it probably isn’t – but in a good way. Miss Aniela is a bit more formal in her style but still, she manages to create a comfortable learning mood with her students. With this video workshop, you wil get an insight into two quite different genres of photography: HDR (landscape and architecture) photography and location protraits. You will get to see a wide range of shooting situations and post-production techniques that can help you enrich your own work. The two parts of this video workshop feel as if they are quite disconnected. Apart from the opening section of the videos, Trey and Miss Aniela do not interact a lot. The only connecting link is the location. So, it really feels like two separate workshops, which is not a real problem. While you are watching, keep the Bonus Files folders open to grab those images and have your own stab at processing them. It shloud be a good excersise to follow what Trey does in the post-processing sections step-by-step first. This way, you’ll really learn some good techniques first hand. But when your through with this, reset those images and start over following your own path. This is the best way to learn.